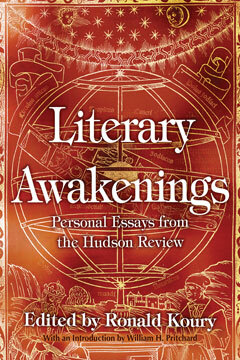 Literary Awakenings: Personal Essays from the Hudson Review, edited by managing editor Ronald Koury, has just been published by Syracuse University Press and is now available for purchase. About the book: During the past thirty years, the editors of the Hudson Review have observed a trend among some of the best literary essayists and reviewers to situate their criticism in a deeply personal manner as opposed to the theoretical, technocratic work being produced in many literary and academic publications. Over time, the Hudson Review became a home for this kind of accessible, memoirist writing. Literary Awakenings collects eighteen essays published over the last three decades that celebrate the writer’s relationship with literature, one that is deeply shaped by experience and remembrance. The essays gathered here recall disparate awakenings to the influence of literature and discoveries of the many ways in which it enriches nearly every aspect of our lives. Antonio Muñoz Molina describes his education as a writer and a citizen as a form of protest against Franco’s totalitarian regime in Spain. Drawing upon Huckleberry Finn, Wendell Berry meditates on the impulse to escape that literature often invokes, and Judith Pascoe’s tribute to Clarissa confesses to the appeal of reading select literature that initiates one into an exclusive coterie of people. What unites these diverse contributions is the joy of appreciation, the pleasures of engaging with literature.